Dubai-based TPConnects, a technology and distribution partner to the travel and tourism industry, has been selected to power Southafricaholidays.com’s operational systems and booking engine. 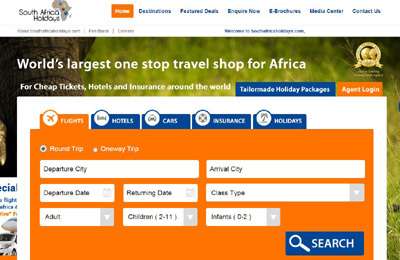 Southafricaholidays.com, the one stop online travel shop for Africa, will route its GDS, LCC airlines and other travel suppliers, including hotels, cars, insurance etc. to the TPConnects booking platform. This will enable its partner B2B travel staff and B2C customers to have a comparative shopping experience by offering the best air, hotel and package rates. Southafricaholidays.com website will operate using TPConnects web services 2.0 - a second-generation, state-of-the-art Java enabled technology platform that provides full access to travel content from both Southafricaholidays.com negotiated and various travel suppliers fed into one system. TPConnects price search, a cutting-edge low price search tool, along with TPConnects Switch, the ancillary and merchandising engine, will help customers to quickly and easily find options that suit their travel needs and budget. "I am pleased to announce that henceforth TPConnects booking engine will process all the flights, hotel, car, rail, packages and other travel products including the online travel bookings in Southafricaholidays.com. We expect this to greatly benefit our customers as our staff and travellers can access a greater number of travel options than before due to the comprehensive content and comparison shopping facility available on TPConnects,” said Gagan Deep, chief marketing officer of Southafricaholidays.com.